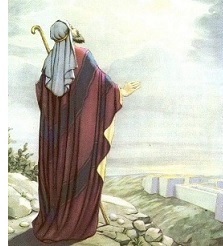 Isaiah - Arguably the greatest prophet of the Old Testament. His book stands out as a masterpiece of poetry, prose, prophecy and history. And at 66 chapters, it is one of the longest in the Bible, covering some 60 years of history. Despite this, not a lot is known about the prophet personally. He identifies himself as the son of Amoz and his ministry covered the reigns of four kings of Judah; Uzziah, Jotham, Ahaz and Hezekiah (Is 1:1). He was married and had two sons (vss 7:3 & 8:3). Perhaps he figures so prominently in the Old Testament record because of the times in which he lived.